14ymedio, Marcelo Hernandez, Havana, 30 November 2018 — The end of the year is approaching and families are setting aside provisions for the December festivities. Beans, pork and salad can not be absent, but the most essential of all products is rice, the distribution of which in recent weeks has shown signs of an alarming shortage in supplies and a fall in quality. With an annual national consumption that exceeds 700,000 tons, this essential ingredient is sold in three types of markets: the bodegas of the rationed system, stores that sell products for Cuban pesos (CUP), and the hard currency stores that only sell products in Cuban convertible pesos (CUC), each of which is worth 25 Cuban pesos. Shortages currently are affecting the latter two options and the customers are complaining about the poor quality of the rice that is available. In the midst of an escalation of accusations between Havana’s Revolution Square and the Planalto Palace in Brasilia, over the Mais Medico (More Doctors) program staffed by Cuban doctors who are being recalled to Cuba, Cuban consumers fear that the diplomatic chill will affect the arrival of the highly-valued rice. Even television comedians allude to its counterpart, the food of Asian origin, as “the worst nightmare” of the coming Christmas Eve. Vietnam is the main exporter of rice to the Island because the national harvest covers barely a third of what is consumed on the island. According to official data, more than eleven million Cubans residing in the country eat an average of 11 pounds a month, more than 130 pounds per person per year. The vast majority of diners will say they have not eaten if there is no rice on their plate, both at lunch and dinner. Suanny explains to this newspaper that the reasons for the rejection of the Vietnamese product are varied. “Many of the grains are broken and the smell it has, even if it is washed several times, is not pleasant,” he says. “Besides, it’s a type of rice that does not cook up with individual grains, but rather is sticky, and we don’t like it that way here.” Similar opinions are heard in all the markets, with the exception of stores in convertible pesos where the origin of the rice is different. Some of those interviewed consider that Cuban rice is barely sold in convertible peso stores due to “quality problems” and “presentation.” Also because of the obstacles that the State still puts on the private farmers before they can place their goods on the shelves of stores in the internal trade network. Domestic rice does not enjoy customers’ favor either. In agricultural markets, its price remains at 4 CUP, cheaper than imported rice. “It’s second because it’s very dirty with small stones, seeds and also grains with husks,” explains Wilfredo del Toro, who manages a market stall in a plaza in Marianao. 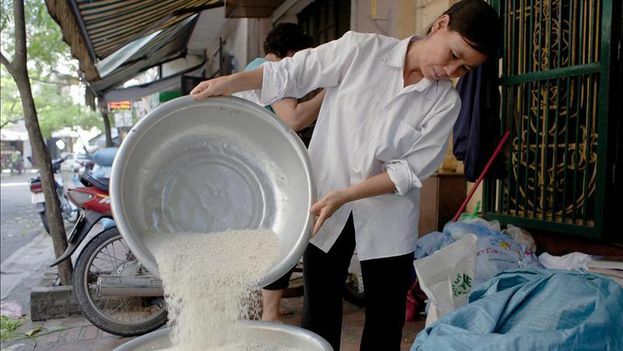 It is common for consumers to spend between 20 minutes and half an hour selecting, washing and “picking” the national or Vietnamese rice before they can cook it, a time that is prolonged if the grain comes from the fields of the Island, due to the lack of sorting machines that clean the product before it reaches the markets. “In the end, what the buyer takes home is a product that can not compete with the one sold in stores in convertible pesos, neither in quality nor in cleanliness,” says the engineer. The rice is moved in hoppers or bags throughout the transport chain from the fields to the markets. Once at the market stalls it is also sold in bulk, which contributes to the addition of particles and dirt to the product. In the rationed market it is common for employees to add small stones or other objects to increase the weight, which leaves them a surplus to sell in illegal networks. Currently, with the problems of shortages that are affecting several areas of the country, the practice of adulterating the national rice has also exploded. This November the planting for the cold season has started and the problems with the quality of the seed already foretell that the goal of planting 139,000 hectares can not be met. The farmer points to the problems with irrigation systems, “in very poor condition given the years and lack of maintenance,” together with the difficulties of drying and transporting the grain once it is harvested, as the main brakes suffered by the sector. “Getting bags [to package it in] is a headache,” he says. The Rice Development Program, managed by the State but with a majority of producers located in cooperatives and private farms, aims to reach a production of 400,000 tons by 2020. But the forecast, according to several specialists consulted by this newspaper, seems too optimistic and even counterproductive for the country’s economy. In the opinion of Israel Lugo Hernández, technical-productive director of the Rice Technology Division, reaching these figures depends not only on seeds and machinery, but also on how the rains behave in the coming years, especially over the territories of Granma, Camagüey and Sancti Spíritus, the regions where the grain is most sown.